"Rollicking, playful, good time blues and intimate, reflective balladry..her songs ring with emotional depth." ★2012 Blues Music Award Winner - Pinetop Perkins Piano Player of the Year. Marcia has been honored with 5 wins in the last eight years, and a total of 15 nominations, in this category. Marcia has also won best Contemporary Blues - Female Artist twice and has won Blues Music Awards for best Contemporary Blues Album of the Year for her CDs So Many Rivers and Presumed Innocent. ★Performances on NPR's A Prairie Home Companion, World Café and Whad'Ya Know?, as well as Public Radio International's Studio 360 and the nationally syndicated Mitch Albom Show. 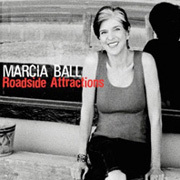 Singer/pianist Marcia Ball knows how to raise roofs and tear down walls with her infectious, intelligent and deeply emotional brand of southern boogie, rollicking, roadhouse blues and heartfelt ballads. Over the course of her three-decade career, Ball has earned a huge and intensely loyal following all over the world. Her exquisite piano playing and passionate, playful vocals fuse New Orleans and Gulf Coast R&B with Austin's deep songwriting tradition into a sound No Depression described as "a little rock, a lot of roll, a pinch of rhythm and a handful of blues." Marcia Ball - Voodoo Experience 2012 from Rehage Entertainment on Vimeo.